New Year’s Eve is just around the corner and the signature toast at midnight usually involves a bit of bubbly champagne. 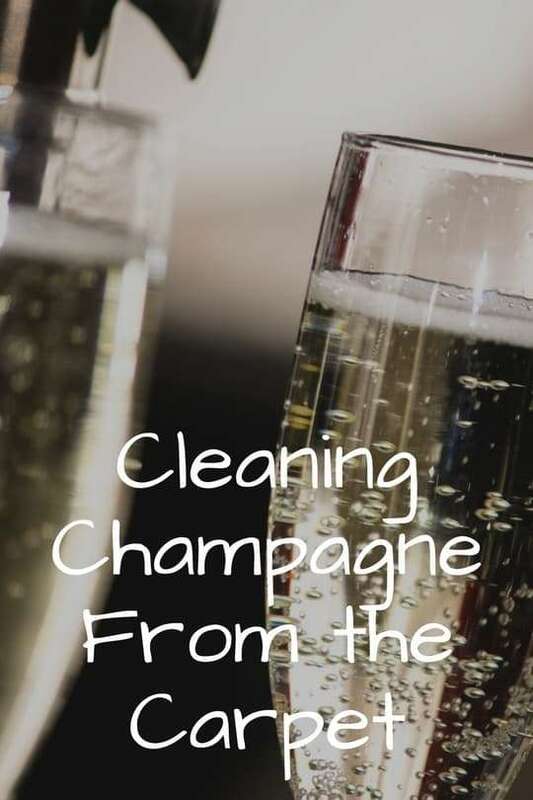 Whether you let the cork fly and champagne was flowing, or someone accidentally spilled their glass on the carpet you don’t have to halt the celebration when you have these cleaning tips. The best way to ensure success with getting champagne out of the carpet is to clean it right away when the stain is still fresh. For a fresh stain you will want some white paper towels, a sponge, club soda, hand dish washing soap, and your favorite all purpose stain remover. Grab some plain white paper towels and soak up as much champagne out of the carpet as you can. When you are no longer able to soak up the champagne, wet your sponge with club soda and blot the spill gently working from the outside toward the center. It is best to use club soda and not seltzer or sparkling water. The carbonation is a huge help in removing the stain, the salt in the club soda is an added benefit to helping prevent any left behind alcohol from browning the carpet. Follow the club soda with a solution of gentle hand dishwashing soap and warm water. Add just a small amount of soap to the water and mix in then apply to the spill with a clean white towel/rag/cloth; again working from the outside toward the center. This should remove the last of the stain from the carpet. If a little champagne is still hangin out you can follow with an all purpose stain remover. Once the stain has lifted make sure to rinse out the dish soap with plain water to prevent it from attracting more dirt. Follow the rinsing by getting the spot as dry as possible. Place a dry cloth on the area weighted down with something heavy. A dried stain will take a little extra effort, but it is still possible to remove the champagne from the carpet. You will want to have a sponge, white paper towels or cleaning cloths, mild hand dish washing soap, 3% hydrogen peroxide, vegetable glycerin, ammonia, and white vinegar. Tip: with this stain removal method you will want to work in the exact order of cleaning solutions in the instructions. If one cleaning solution does not work continue on to the next one until the stain is lifted. Make sure to rinse each solution with clean clear water and blot very dry in between each cleaning solution. First try club soda, wet your sponge with club soda and blot the stain working from the outside toward the center. Mix up some mild hand dishwashing soap with warm water. Use a clean white cloth or paper towel dipped in the soapy water and blot from the outside working toward the center. When the stain is gone or no longer lifting from the carpet rinse the soap with water and then dry. If the stain remains after the dish soap mix one part hydrogen peroxide with six parts water and a very small amount of dish soap. ( Be extra careful with peroxide it can work as a bleaching agent, test on an unseen area of carpet first.) When stain is lifted or no more is coming clean rinse with water and dry. Next try a mix of equal amounts liquid vegetable glycerin and water. Wet a sponge with the mixture and blot from the outside working in. If the stain till remains try 2 tablespoons of ammonia mixed with 1 cup water. Do not use this solution on wool carpets. Once the stain is completely clean, don’t forget to rinse the cleaning solution from the carpet with clean water and to dry the spot. Once the stained area is clean and dry you can re-fluff the carpet fibers with the vacuum. If after all your efforts the stain is still not coming out of your carpet call in a professional carpet cleaner to help you out. The team at All Kleen is skilled at stain removal and carpet repairs. Make an appointment online today.